Russia on Tuesday vetoed a US-drafted and sponsored UN Security Council resolution on the alleged chemical incident in Syria that would have created a new inquiry to lay blame for chemical weapons attacks in the war-torn country. The draft was designed to fail and thus “justify” unauthorized action in Syria, Russia’s UN envoy said. Twelve council members voted in favor, while Bolivia joined Russia in voting no. A resolution needs nine votes in favor and no vetoes by Russia, China, France, Britain or the United States to pass. Most interesting was the abstention vote by China, which again suggested that when it comes to Syria, Beijing may side with Russia should a conflict break out. To this, Russia’s envoy to the UN, Vassily Nebenzia, responded that "we will not be able to support the American draft," adding that when Douma was allegedly targeted by chemical weapons, the US side declared it already knew who was at fault — "Animal Assad," Russia and Iran — so the US proposal appeared insincere. US President Donald Trump has already promised to respond "forcefully." Nebenzia said the US resolution, despite Washington claiming to take Moscow’s concerns into consideration, was effectively an attempt to resurrect the deprecated Joint Investigative Mechanism (JIM). Even if the US project was adopted, it would take months to implement, the diplomat said, adding that the draft was a “provocative step” that had “nothing to do with the desire to investigate the Douma incident.” He said it was obviously designed to fail in order to serve as a justification for unauthorized military action against Syria. “Why do you need the attribution mechanism, if you’ve already named the perpetrators before any investigation?” Nebenzia said, referring to blatant accusations against Damascus coming from the US and its allies. 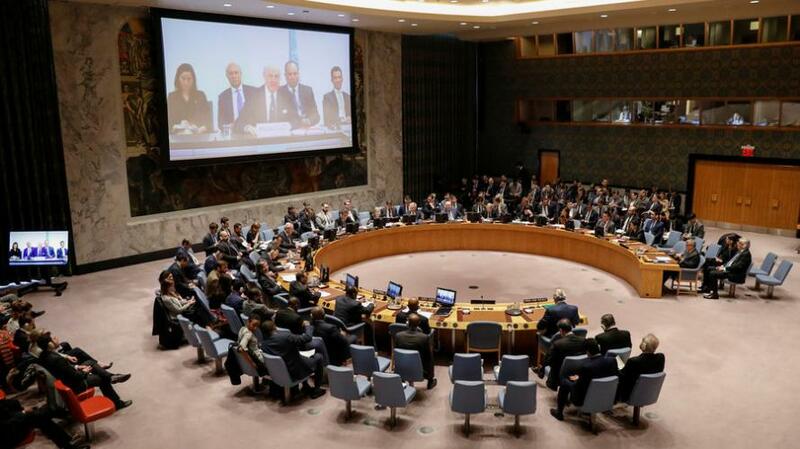 Shortly thereafter, a rival Russian bid to create a new inquiry into chemical weapons attacks in Syria also failed at the U.N. Security Council after the draft resolution only received six votes in favor. Seven members voted against and two abstained. UK envoy Karen Pierce said Moscow could always "suggest that we refer the matter to" the International Criminal Court. The UK voted against the Russian measure because it allows sovereign states to operate above the law, the UK diplomat said. Following the failure of both the Russian and American proposals, Nebenzya stated that if the United States "took the decision to carry out an illegal military action — and I do hope you come to your senses — well, then you will have to bear responsibility for it yourselves." The alleged attack was reported on Saturday by anti-government groups, which claimed that the Syrian Army dropped a chlorine-filled munition on the area, affecting dozens of civilians. However, no solid facts on the purported incident have emerged yet and according to US government officials, there is no evidence that the Assad regime was behind the attack.